Nizar al-Wazir came to the United States on a Fulbright grant from Gaza in 2007. He currently works in Washington D.C. at Chemonics, a development consulting firm. He joined Worldfocus to discuss the hardship of coming and going from the Gaza Strip. Worldfocus: You’re from Gaza, but you weren’t born there? 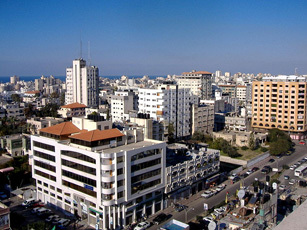 Gaza City in 2007, the year that Hamas ascended to power. Nizar al-Wazir: My family has lived in Gaza City for generations, but I was born in Dubai 27 years ago. My parents were unable to return to Gaza after leaving the coastal strip to study abroad in the late 1970s. After the UAE, we lived in Jordan for three years — until the Oslo Accords allowed us to return to Gaza in 1994. I did high school in Gaza before attending Birzeit University from 1999 to 2003. But I couldn’t visit my parents 60 miles away in Gaza, due to the 2nd Intifada. Worldfocus: Is your family involved in politics? Nizar al-Wazir: My uncle, Khalil “Abu Jihad” al-Wazir, was a co-founder of Fatah. He was Yasser Arafat’s right hand man and the commander of Fatah’s al-Assifa military wing. He was exiled from Israel to Gaza in 1948, and then from Jordan to Lebanon to Tunisia. He was assassinated there by Israel in 1988 — at the beginning of the first Intifada. My family has always been Fatah, but my parents stay out of politics. They still live in Gaza City, where my father is a consultant for the Fatah-controlled Ministry of Finance. My mother is a deputy assistant at the Ministry of Education. Worldfocus: When do you think Palestine will achieve statehood? Nizar al-Wazir: We were optimistic after Oslo, when I attended the Seeds of Peace Camp in the U.S. After the beginning of the second Intifada, F-16 bombardments were regular. Electric generators were knocked out, so we had power for five or six hours each day. After Shalit was captured, we had sonic booms over Gaza five times per day — for over a month. Anyway, I don’t see the Palestinian state coming any time soon. The West Bank is too divided into small cantons, and Gazans are too extreme. Worldfocus: In 2008, the U.S. State Department cancelled seven Fulbright grants because the recipients could not get visas. After a diplomatic outcry, the grants were reinstated two days later. Could you explain the political issues at stake? Nizar al-Wazir: With a Palestinian Authority passport, one can travel everywhere. But getting a visa is the difficult part. Israel has imposed strict movement restrictions since Hamas took over Gaza. I can’t even have friends from other countries visit me in Gaza. The Department of State even sends different forms to Fulbrighters in Gaza and the West Bank. We are not viewed as being from the same Palestinian entity. I was nominated for a Fulbright scholarship for the first time in 2005. But I couldn’t get a placement at an American university because I couldn’t travel to either Egypt or Jordan for the GMAT. Of the seven Fulbrighters chosen from Gaza in 2007, only three made it to the U.S. — mostly via personal connections. But there was no media attention that year. In 2008, seven Gazan Fulbrighters were very close to losing their scholarships, until the media alerted Condoleezza Rice and the international community. Worldfocus: After your work in Washington D.C. is finished, will re-entry to Gaza be difficult ? I plan on returning to Gaza at the end of this summer. Some of my friends think I should go back to the West Bank and not Gaza. But since I’m in the U.S. on a State Department grant, the U.S. Embassy in Jerusalem might organize a group re-entry for a group of us to re-enter Gaza. Photo courtesy of Flickr user OneArmedMan under a Creative Commons license. It is not “their” own fault, it is the terrorists fault. Israel’s blockade of Gaza is collective punishment. It is almost like throwing the entire population of Tel Aviv in prison because of the actions of some Jewish extremists. Funny, I just read this article on Haaretz: http://www.haaretz.com/hasen/spages/1106689.html. Maybe Israel wouldn’t restrict movements so much if terrorists would stop coming into Israel from Gaza. It’s their own fault. Don’t blame Israel for the lack of a Palestinian state, they’ve been open to one since the beginning. Blame Hamas and Palestinian in-fighting. If the Palestinian people could just unite and stop terrorism they’d have a state in no time.